Time for a giveaway #2. If you've already read the first post I'm sorry that you have to read my story again, but the question is the same, feel free to skip down to the comment form. 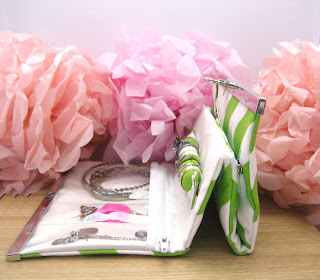 If you wish to enter the craft supply giveaway check it out here. Hi there to all the newbies and to my followers an extra special thanks for hanging with me. I've had a busy week but I did managed to finish my 5000 word psychiatry essay early - well on Friday, and it was due Monday, so I had a guilt free weekend sewing up my new idea. I started with a magazine prototype, then I did a quick version with some cheap not so pretty ikea fabric (the one with the creepy birds - in my defence it was cheap, and I was convinced I would have a use for it - and three years later I have), then the good version I made was too short for my frame! So version no.4 is finally complete but I'll get back to it later. I'm sure you're all hanging out to see what I'm giving away. The giveaway item is a handmade Sandi ID Wallet - a simple snap pouch with a clear ID pocket on the back in Timeless Treasure's Owl fabric. 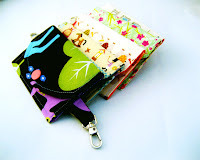 The ID wallets are also available in my etsy shop and I also have a free tutorial on how to make them here. **If you wish to enter both competitions; the craft supplies and the handmade giveaway you will need to post comments on each post. 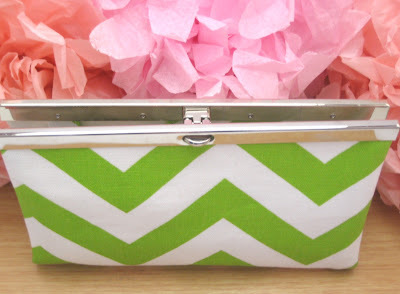 Love the clutch idea - would definitely rather have a pattern as I like to embelish as I sew! I have had the same earings and necklace for the last 6 months I think but this idea is totally GENIUS !! Wow !! If I was wearing more jewellery, I'd definitely want to buy one of these ! i like the clutch! i'd prefer to buy one, as finding those specific supplies (the clutch closure) can be difficult where i am. That is a fabulous idea and I would love a pattern as I am a bit of a do-it yourselfer! Brilliant idea! I would buy the clutch for 2 reasons: (1) might be hard to find the right hardware, and (2) I'm really bad about finishing projects even when I have all the patterns & materials! If I were to need this much jewelry on a trip, this 'pattern' would enable me to embellish and change things up a bit. As far as my traveling goes, I am going to Sweden & Finland this summer and I plan on taking two pairs of earrings (wearing one) and one or two necklaces. I see this more for going to trade shows where you need to wear more jewelry and change it up. So, for me, travelpak is a bit of misnomer. This would be great if you performed in summer theater and needed a way to keep all your jewelry organized and visible. Oh- you might consider turning off the undecipherable word verification. Nobody can figure out the letters and you can always 'approve; your comments and blogger does a bang-up job of spam detection. Thanks for your feedback it's been really helpful. Would you know I never even knew that I had word verification on? It took me a minute but I figured out where it was under the settings and turned it off. Thanks for the heads up. I've never seen travel jewelry clutch like that before but I think it is AWESOME. Such a cool idea, and so functional and pretty. When I travel, I like to put my belongings into different zip pouches to keep everything organized and I think something like that would be perfect. ...AND a follower on facebook! love this idea, would love a chance and would definitely buy one! 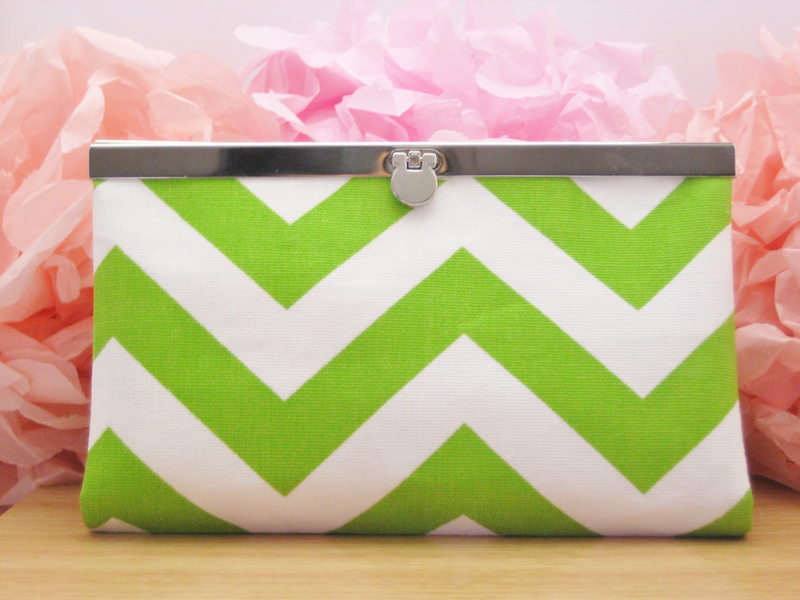 That clutch is super-cute! I'd probably want to buy it made because I don't like sewing tiny things like that. Adorable and creative idea. If it was $10, I'd just buy it. More? I'd probably attempt to make it. That is an amazing idea! I would love one of those! I think for something like this I would purchase the already made item. And what a fantastic gift it would make! This is a brilliant idea...and I don't even wear jewelry! For something like this, I'd probably be more inclined to buy the bag than a pattern. great idea! i would still worry about the rings crushing since they are not laying flat. I love the idea! I'd buy it ready made though because finding hardware where I am is near to impossible. I would probably prefer to purchase a complete clutch, but only because I've already got so many projects lined up I know I wouldn't get it done otherwise. It looks very pretty and useful! I like the concept but I would worry about how the press studs would hold up to repeated pressure on them when opening and closing the clutch bit. I don't know how much they pull and how you would anchor the sides if you didn't use them, but that would be a concern to me if buying online. I would purchase the finished clutch, looks a little complicated for my skills! ;) Otherwise I really like the organization of it... and as long as the snaps don't wear out.. its great! what an ingenious use of supplies and a great way to travel with jewelry! IT IS BEAUTIFUL!!!!!! SUPER AWESOME! I love the clutch idea, really cute. Though it would be nice to have a pattern/tutorial so I can get use the fabrics I like. As for the owl wallet! I LOVE RETRO OWLS AND MY BLOG'S LOGO HAS OWLS IN IT! I HOPE I WIN THIS! I'm a new follower via GFC and RSS Feed. I don't usually carry a lot of jewelry when I travel, but I have familly members who do. I would love to see a pattern for this! I love your clutch and would prefer to purchase one especially if I could specify the fabric I wanted. I definitely like the clutch idea! I don't wear much jewelry...but my mother has a TON, and a bunch of traveling coming up, and I'm sure she'd love such a unique, personalized gift. :) Thanks for the chance to win! I don't wear a lot of jewelry, but I know others who would absolutely love your idea! I love your design! I think it's perfect! I think you should make a pattern and have some samples for sale on etsy as well!!! That is a great idea, I'd love to see a pattern for that. Fantastic idea! I would love the finished product! Thanks for the chance to win! Not a follower, but a fan on facebook! 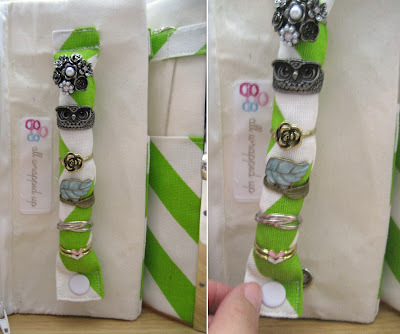 I like this clutch idea, I've only ever seen thehanging organizers with pockets, and my necklaces and stuff get tangled in them! I love the clutch, it's an amazing idea. Thanks for the giveaway! I think it's a great idea! I'd probably be more likely to buy the finished product. Thanks for the giveaway. I think your jewellery clutch is way more useful and interesting. I prefer it by a long shot because it is unique too. And I love your fussy cutting on the owl purse at the top! Great giveaway, thanks! Holy cow, that is BRILLIANT! I would totally use that! I think I would rather just buy it than make it haha. Plus I absolutely love the chevron print. Too cute! LOVE this! I like it like it is and would probably purchase a pattern, but who knows? In a pinch, I might buy the clutch! Thanks for the SMS giveaway! I would prefer to purchase the product and not a pattern. I reeeealy like this organizer! I gave it a good look and I can't see how you'd improve it--you've thought of everything! I just checked to see if you had it listed for sale. no :O( Love that green!! Now then, about that question. I like the organizer and would buy it (versus a pattern). I don't have the patience to make things like this. i'm a plain and simple girl who doesnt wear much jewelry, if i did... i would totally use it! I'd love to make this or buy it! :) Super cute idea!! I love this idea! I would want the pattern because I want to do it myself. It's really cute, I don't really even have that much jewelry so I'm a bad judge of these things. I would buy one for a friend though! Thanks for the chance! That is a really neat idea! I travel a lot and that would come in really handy. I think I'd prefer to buy the pattern so I could make it myself. Just became a follower. Love your blog. The jewelry clutch is fab! I would buy one! What fun. I would prefer to buy it ready handmade. Great clutch idea, but I am not your target audience. I rarely wear jewelry and never bring it with on vacation. But I do love your wallets (and am completely impressed how perfectly you have the fabric matching up). I think the clutch looks lovely, and can't suggest any changes. I rarely travel with significant quantities of jeweley though, so probably wouldn't buy one personally, although might get one as a gift. Oh, and I now subscribe in my feed reader and follow you via facebook. That clutch is awesome. Normally, I prefer patterns for things so that I can add my own elements, but in this case, I'd want to buy the finished clutch because I'm not sure I could source all the hardware involved. It's a truly brilliant creation!! That is so creative!! I do not wear much jewelry, nor do I travel much. I think it is just great the way it is! 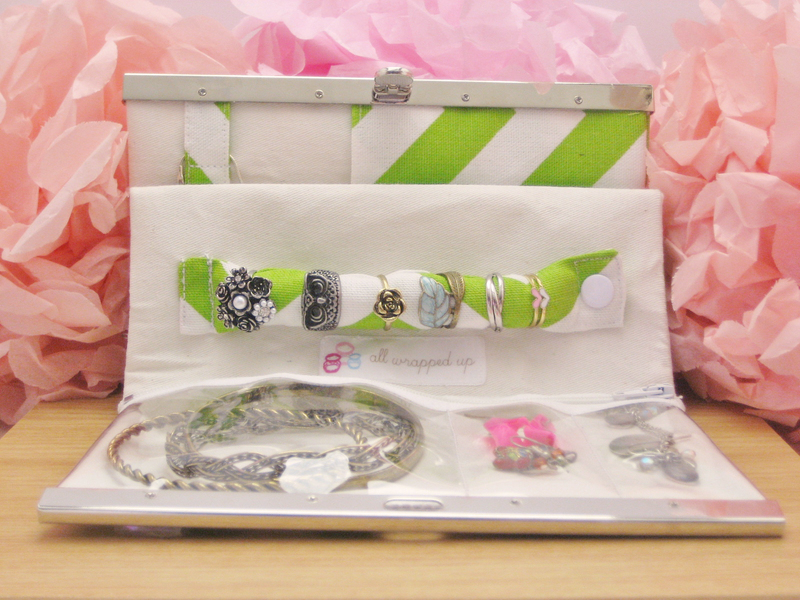 That is such a cute jewelry organizer! I'd definitely be interested in a pattern for it. Would make great gifts!!! I like it, but I'm not sure whether I would buy it. I don't have a ton of jewelry, probably enough to fill something like that with my whole collection, rather than the few things I would take on a trip. Generally I prefer to buy patterns over products. I do like it when shops sell both because then I can see so well different ways the pattern could turn out. I think that's a really cool organizer and an awesome idea! Well done! As for buying one, I might as a gift but I would also love a pattern so I could make one myself. I love the clutch idea. The only thing i would add would be a strip of broidery anglais or lace with regular spaced holes for earrings, just because i tend to loose things if i couldn't store them in pairs. But i know that isn't to everyones taste! I think the clutch is a clever idea! I think I would purchase one, but I might buy a pattern if the supplies were easy enough to obtain. Thanks! That organizer looks great. I think it might be fun to try to make one. That is such a cool idea! I would probably be more likely to buy the clutch, since I know that if I bought the pattern I would get halfway through and never finish it. That is a totally clever clutch! I'd definitely rather purchase it already made, that's way above my sewing level! Holy cow - that's so cool! I'm more likely to buy it because my skills aren't that good yet for sewing things that are more complex. LOVE it. I love the clutch! I like patterns, but this is something that I'd probably buy just because of the hardware needed. Oh my gosh, I love that! I would defo want to be able to purchase the real thing... I'm not that good at sewing...But what a great idea! Wish I had had that for my honeymoon. I love the travel case!!! It would be amazing in a vintage floral! :) I don't think I would change a thing... it is amazing! You did a great job making your jewelry organizer. I wouldn't mind having the tutorial to make my own. 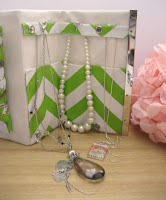 I like this style jewlery organiser, although I pretty much gave up wearing jewlery when I had babies. I'd rather buy one already made than sew one. thanks for the giveaway! Wow what an ingenious idea!! I love it. And would prefer to purchase it already made. I've still got a lot to learn about making bags. Wow I love it! I would buy it right now! I really want it, or a pattern. it is perfect for what I want!!!!!!!!!!! There's definitely benefits to both. With a pattern I could make it with fabric that matches other travel accessories of mine, but being able to purchase an already made one would be awesome. That is the cutest jewelry clutch! I'd prefer a pattern, 'cuz I have some fabric that I think would be perfect. As I rarely take jewellery except what I am wearing it is not really an issue but I love your version way more than the roll idea. I always worried about breaking something. I think I would prefer to make it but I am not sure I could find the metal thing easily. I'd be worried things would fall out. I'd rather purchase a complete item than a pattern. I love this clutch. I think its a great idea and I would definitely purchase the complete item because it looks too difficult for me to make. Thanks for the giveaway! 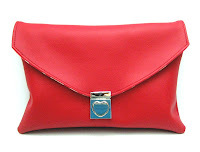 I love your clutch, such an original design! I would definitely be interested in a pattern, but I am sure that many would prefer to buy already made. I think your organizer is amazing...it looks very practical and I think I would like it better than a roll style. However, with that said, I rarely wear anything but my wedding jewelry, so I wouldn't use it personally...but it'd definitely be a great gift! It's great. Yes I would purchase pattern. Good luck with your studies. I love the owl wallet! And for the question...why don't you sell both the pattern and clutches? well, I probably would have a hard time finding the hardware to make this so I would probably purchase it ready made. You did a superb job of matching the fabric on the owl wallet...it just wouldn't look as cute if you hadn't taken the extra time to do it right! I would love either. A pattern or the clutch! And I think I would just buy one pre-made. Purchase, I think. Thanks for the giveaway chance. I love owl so it would be perfect.I love jewelry organizer and it is so lovely and useful that I would be using it at home too,not just on travel.For me finished product would be great. This is a wonderful idea, love it. I would buy one cause I'm not good with sewing. 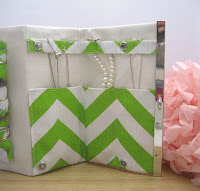 You could also make a notebook holder with those purse frames or a photo book too. I think the pre-made bag would be more appealing. I think you've done a great job thinking of all the little things that are needed. I like the organizer. I would prefer to buy an organizer already made rather than a pattern. Honestly I would say both. Part of me would love to just buy one already made. But I would love to be able to use my own fabric and maybe tinker with the available spaces and pockets to fit my own jewelry better. 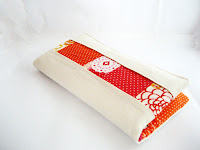 I would definitely purchase a completed clutch over the pattern Thanks for the chance to win! I am a new blog follower - looking forward to your tutorials! Thanks! I think I would buy the pattern. I like the look of the clutch I have plenty of friends who could make good use of a clutch like this. I have also added myself to your followers. I love this idea...I would buy a pattern and make them for people I know who travel. Thanks for participating in giveaway day. i personally don't wear jewelery, just my wedding ring. BUT if you made one slightly larger that could accommodate makeup things THAT would be something awesome! Very nice! I'd like one with more room for earrings. Wow, I love the idea of folding a jewelry organizer, rather than rolling it! I don't travel with much jewelry, but the few times I've tried to, it's gotten rather disorganized. I'd sooner buy a finished organizer than a pattern for one; I've never seen frames like that where I live (although I'm sure I could find them online). That clutch is so awesome! 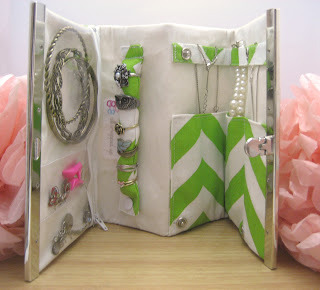 I'd rather buy a finished organizer, because it would take me a lifetime to actually complete one! LOVE IT. That's amazing. I really like the new idea/use. I don't think I'd be capable of making this myself, so I would say I'm more interested in the finished product. LOVE! So cute. I'd prefer the pattern. This is awesome. I would prefer the finished project. I love your projects, the ID wallet is darling. The jewellery roll is great too. I can see where it would work better than a bag. This way everything stays put. I would prefer the finished project. I find it hard to work with smaller items and so many pockets. You do beautiful work. Thanks for the great giveaway. That organizer is AWESOME. I looked and looked and I couldn't think of one thing I would change. I would buy it either competed or as a pattern - I'd need to have a recommended source for the hardware though ! Wow! that is a great idea for a jewelry clutch! What a great gift idea for someone! Thanks for the great giveaway! The owl wallet is just so cute! Love your clutch! I would buy a pattern and attempt it myself. I like that style of jewelry holder. I would prefer to buy made objects rather than a pattern. Oh my stars! How clever is that jewelry clutch. I would love to buy the clutch rather than the pattern because the hardware is hard to find around here. My teenage daughters and their friend would also love the clutch. It would make a great gift. I think I'd rather have the pattern and give it a try! I love the jewelry clutch. Very clever and unique idea. I think the pattern would sell. I have never seen closures like that so perhaps there could be more than one way to close it? I vote for a pattern! This is a GREAT idea!!! I love your idea on the jewelry clutch. I think the completed clutch would be nicer than the pattern (simply because I don't do well with the clasps, etc.). Thanks for the chance! Today, I would buy one of those jewelry clutches! I would like the option of buying the pattern too. I like the clutch and I would be more interested in purchasing it. I LOVE this little clutch idea. Right now my jewelry gets put in a little ziplock back and gets all mixed up when I go away, it is a mess. I wouldn't change anything, I think it is great just how it is. I'd love to and would prefer to purchase something like this, but would also be willing to purchase a pattern and attempt it myself. I love the clutch- I would prefer finished just because it looks a bit tricky to get it to look just right. Wow. I saw the jewelry organizer and thought "Oh wow! I want to make one of those now!" So yes, I would love to purchase a pattern! That organizer is a wonderful idea. I'd love a pattern! I would purchase a completed clutch. That style looks daunting to sew. Love the idea! I would probably want to just purchase one. I totally know I will never be satisfied travelling with jewelry until I have a clutch like this...it's perfect! I would also prefer to buy it premade. There's no way I could get it done myself. Thanks for the giveaway! Jewelry case is really neat! I probably wouldn't buy it or a pattern - because I don't wear enough jewelry to need one, but it's really cute! I love love love the clucth - although I may be partial because my favorite color is lime green. =) I'm also lazy, so I would prefer to buy it handmade instead of just a pattern. I love both of your items. They are great. Lovely clutch- I'd rather purchase it complete as I'm not sure my would look so professional. Thanks for participating in the Giveaway Day. That clutch is so cool! I'm a pattern girl myself...I like to make one for me, one for my mom and one for each of my sisters...all in different fabrics! :D I know lots of people would prefer to buy ready-made though. I love everything about it!! Love it! that is a great idea. I never thought of that. Now i realize that i totally need one of those. Wown that's such a detailed clutch! I would rather have the pattern and make it myself, adjusting to the types of jewelry I'm usually wearing ... But selling it is also an option, since some supplies are not readily available to anyone. Or maybe a kit? So people don't have to worry about the findings, and could just make it themselves? I would rather buy an already made clutch :) I like the idea! I love the jewelry clutch - and I'd rather buy a finished product due to the trouble of trying to get the findings/clasp. This is very clever. I really like this. I would rather buy it than a pattern since you did such a great job. I 'll throw my 2 cents in again, :) - I would enjoy the challenge of making them so I would vote pattern. thank you for offering up this giveaway. I'm not sure how this could be improved on - it's a great idea! I'd definitely buy it, I'm always losing my jewellery. I think this is such a great idea! I rather like buying the clutch versus the pattern simply because it might be a pain to find the hardware. I love your jewelry clutch. I so like how the items are separated and stay so neat. Thanks for the great giveaway! I like the jewelry holder as is, but in truth I'm not likely to buy it. At least not for myself. All my jewelry is stashed on a box atop my chest drawer. Nothing fancy, but it works for me. I might be tempted to buy this as a gift for someone else. In general, I'm more likely to buy patterns than finished products. That's specially true when it comes to bags and purses, because that's what I make. Now, in the case of this particular item... IF I were to buy it, I'd probably get it finished. Why? Because of the metal frame. I don't have any in my stash and I have never used them. Whew! This comment was much longer than what I expected. In any case... Thanks for the chance to win! I love the jewelry clutch idea! I typically use big purses, and if my jewelry is in a small pouch or something, everything gets all tangled and it's a pain! i love it and i would MUCH rather purchase the actual product that the pattern, you do an amazing job!